Asking bridesmaids to be in your wedding? 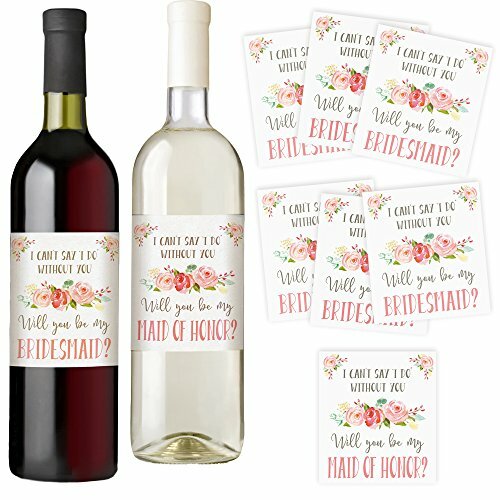 Ask them in style with Printed Party's unique wine bottle labels! Our waterproof labels are the perfect way to include a gift and ask them to be part of your special day. ►INCLUDED - Each order includes 7 waterproof labels created by our talented team of designers. I can't say "I do" without you. Will you be my Bridesmaid? I can't say "I do" without you. Will you be my Maid of Honor? ►QUALITY - Each label is printed on a high quality 4" x 4.25" glossy sticker sized to fit most standard 750 ml wine bottles or champagne bottles. All labels are waterproof. STANDARD SIZE - Our 4" x 4.25" adhesive labels will fit most standard wine bottles. Minor assembly required- just peel and stick to your favorite bottle of wine. Remove original label for best results. WATERPROOF - Our bridesmaid wine labels are printed on our highest quality waterproof glossy labels. Serve refrigerated or in ice! . BRIDESMAID PROPOSAL - A unique way to ask your bridesmaids and maid of honor to be part of your big day. BRIDESMAID GIFT - Our wine bottle labels make the perfect gift. Give to your bridal party for a unique way to ask them to be in your wedding.